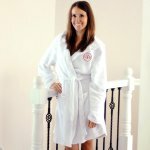 Bridal shower bathroom gift ideas may seem limited at first. But there's much more to a bathroom than just towels and soap. The couple probably has decided how they will dress this room. It may coordinate with the master bedroom, or with another adjacent room. They may have chosen a totally separate color scheme. Your invitation may have included where the couple is registered. This will often give you a good idea of their preferences. Scan the list and take a look at the items they've chosen. The following list may give you some new ideas. 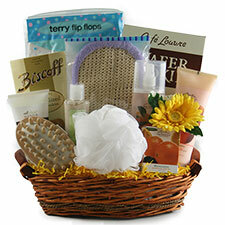 Perhaps you will put together a pretty Spa or Relaxation basket filled with several of the items, below. Another idea is to add a monogrammed robe as the focal point of your basket, and then surrounded it by smaller items. Try to incorporate a unique container as part of the gift. For instance, you could use a waste basket that complements the colors they've chosen, as the holder. You could also select any type of organizer that could be used in the bathroom, as your base. An unexpected container often adds to the visual appeal of the present. Let's see what the bride or couple you're choosing for, could use. *** Whether you take a suggestion from this list or come up with a different one, your present will definitely be appreciated and used often. • Go from bridal shower bathroom gift ideas, to gift tips. 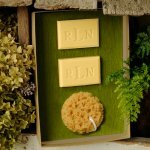 A spa robe or soap set are sure to be a hit.